Ohio Class Ballistic Missile Submarine: Laid down, 23 October 1992, at the Electric Boat Division of General Dynamics Corp., Groton, CT; Launched, 27 July 1996; Commissioned, USS Louisiana (SSBN 743), 6 September 1997; Louisiana is in commission, assigned to the Pacific Fleet at Naval Base Kitsap, Silverdale, Wash.
296k Louisiana (SSBN-743) bow view on the ways at the Electric Boat Division of General Dynamics Corp., Groton, CT. Courtesy of Lester Palifka. 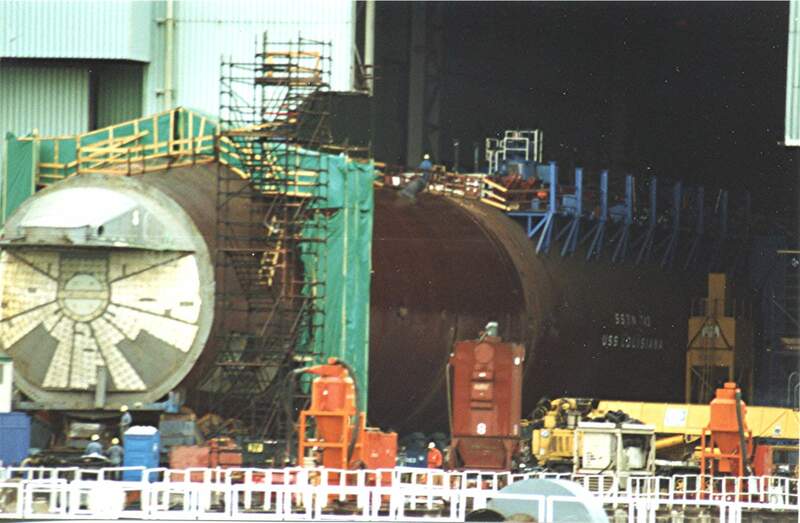 202k Louisiana (SSBN-743) commissioning photo 6 Sept 1997. 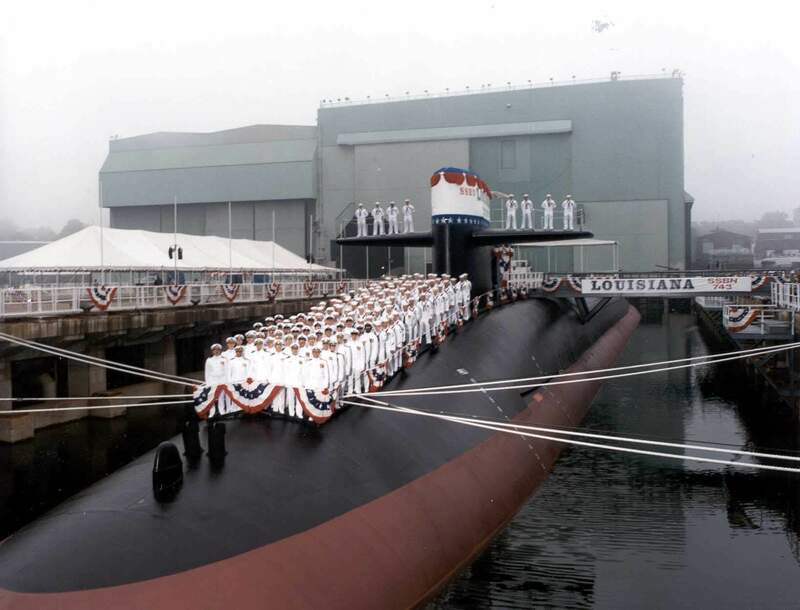 Courtesy of Electric Boat Division of General Dynamics Corp.
130k The crew of Ohio Class Fleet Ballistic Missile Submarine Louisiana (SSBN-743) line the deck during her commissioning on 6 September 1997. U.S Navy photo # DN-SD-07-09863 by Mass Communication Specialist Second Class Deborah Quon, from the Department of Defense Still Media Collection, courtesy of dodmedia.osd.mil. 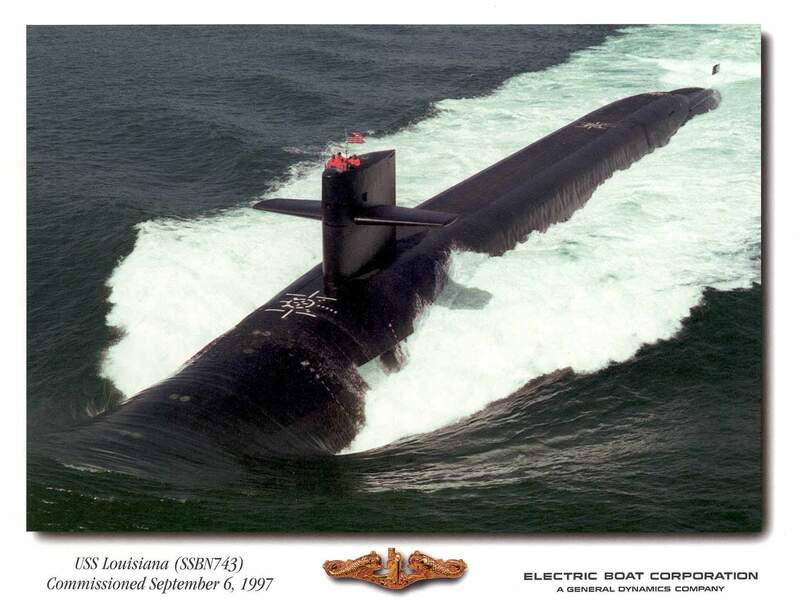 919k Louisiana (SSBN-743) and her seal on the high seas. USN photo courtesy of Scott Koen & ussnewyork.com. 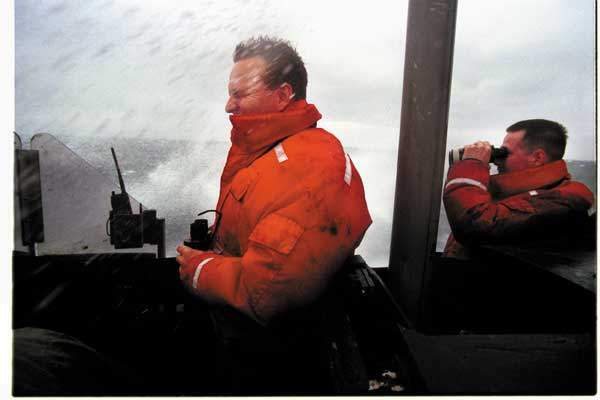 20k STS1(SS) Scott Pitre (left) and SK3 Gregory Hurst scan the horizon aboard Louisiana (SSBN-743). 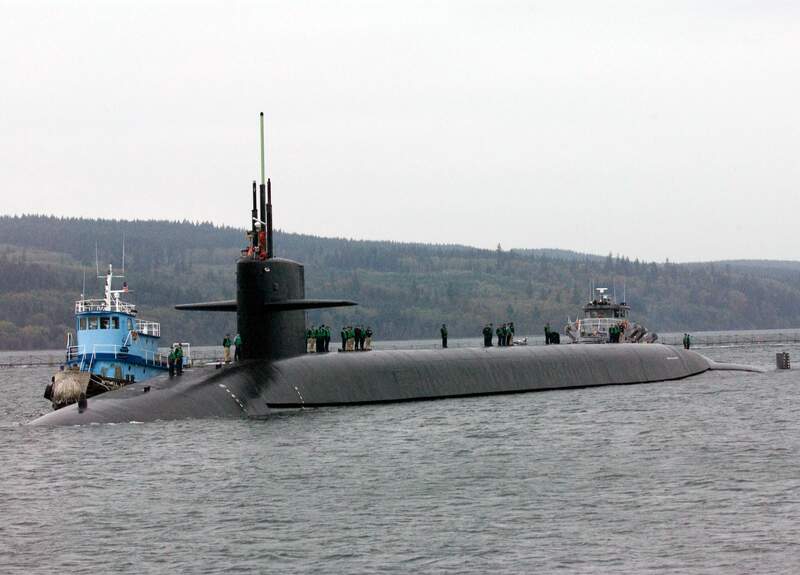 The Navy's newest Ohio-class (SSBN-726-43) submarine got a real stress test from Mother Nature when eight-foot waves pounded her hull during pre-deployment sea trials in April 1999. Louisiana is the final ship of the class to be commissioned. Photo by JO1 Robert Benson, courtesy of All Hands Online. 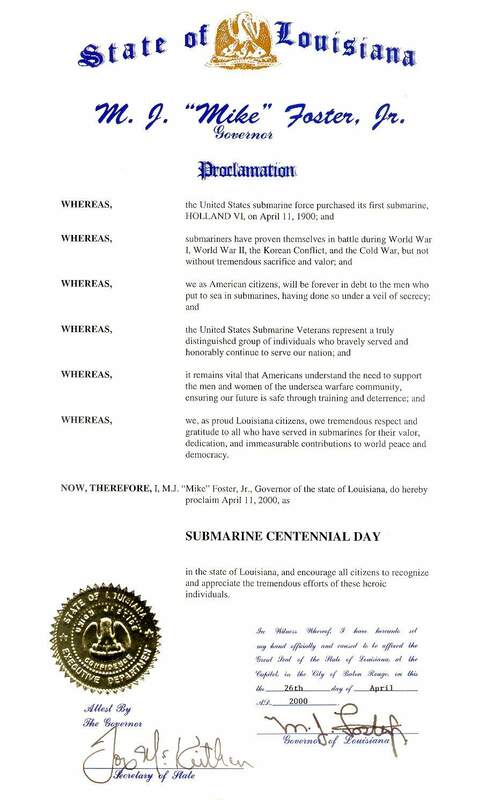 148k Submarine Centennial Day Proclamation, 26 April 2000, signed by the Governor of the State of Louisiana in honoring the State's namesake, Louisiana (SSBN-743). USN photo courtesy of chinfo.navy.mil., submitted by Bill Gonyo. 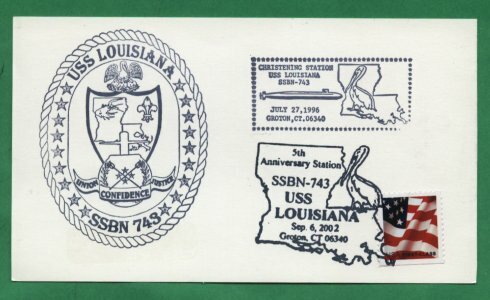 35k Commemorative postal cover issued on the occasion of the Louisiana's (SSBN-743) 5th year of commissioning, 6 September 2002. 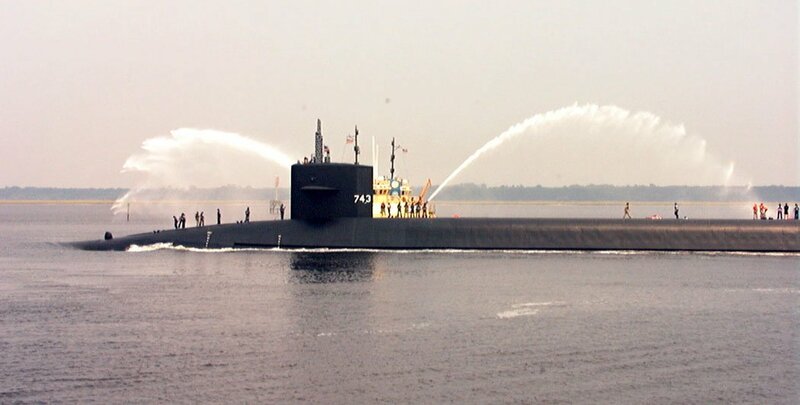 Courtesy of Electric Boat Division of General Dynamics Corp.
71k Louisiana (SSBN-743) entering US Naval Station Kings Bay, GA., date unknown. USN photo submitted by Fabio Pen~a, courtesy of Kings Bay Naval Station web site. 488k The fleet ballistic missile submarine Louisiana (SSBN-743) arrives at their new homeport of Naval Base Kitsap, Silverdale, Wash., 12 October 2005. Louisiana was formerly homeported at Naval Submarine Base Kings Bay, Georgia. USN photo # N-6497N-096, by Mr. Brian Nokell, courtesy of navy.news.mil. 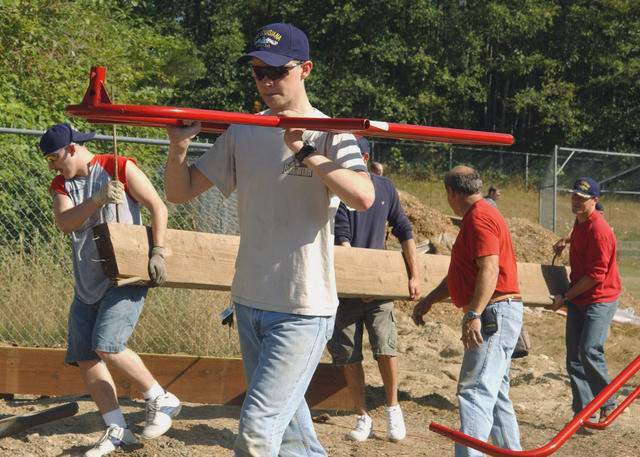 61k Machinist Mate Fireman (MMFN) Chance Dean Bridges (foreground) carry a piece of playground equipment while other USN Sailors carry a large plank of wood during a community project at Breidablik Elementary School at Poulsbro, Washington (WA) on 12 August 2006. 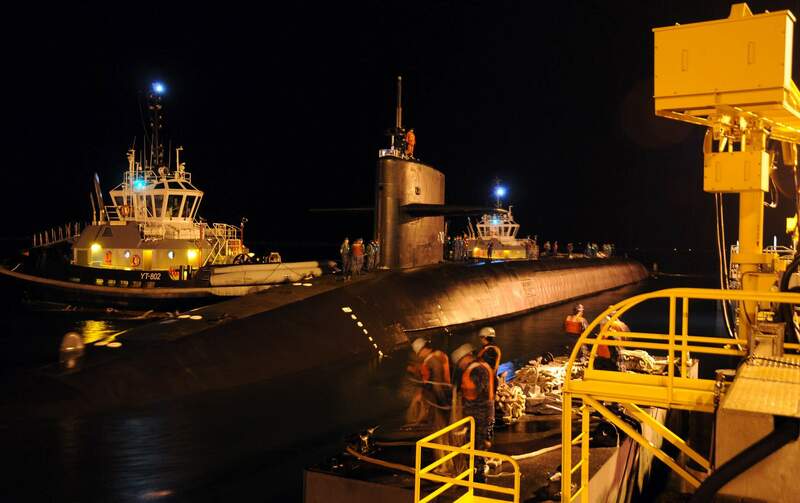 The Sailors are crew-members aboard Ohio Class Fleet Ballistic Missile Submarine Louisiana (SSBN-743). U.S Navy photo # DN-SD-07-09863 by Mass Communication Specialist Second Class Deborah Quon, from the Department of Defense Still Media Collection, courtesy of dodmedia.osd.mil. 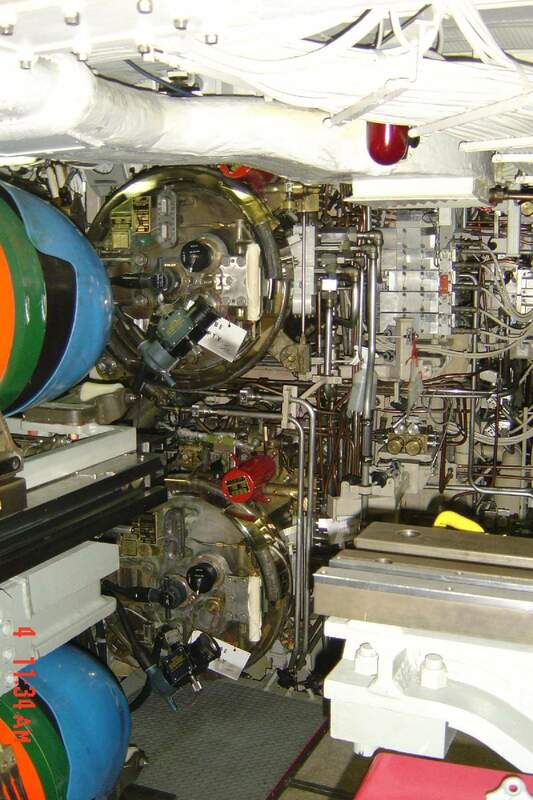 252k Torpedo room on board the Louisiana (SSBN-743). U.S Navy photo courtesy of Webshots by Rocky3168 & submitted by Bill Gonyo. 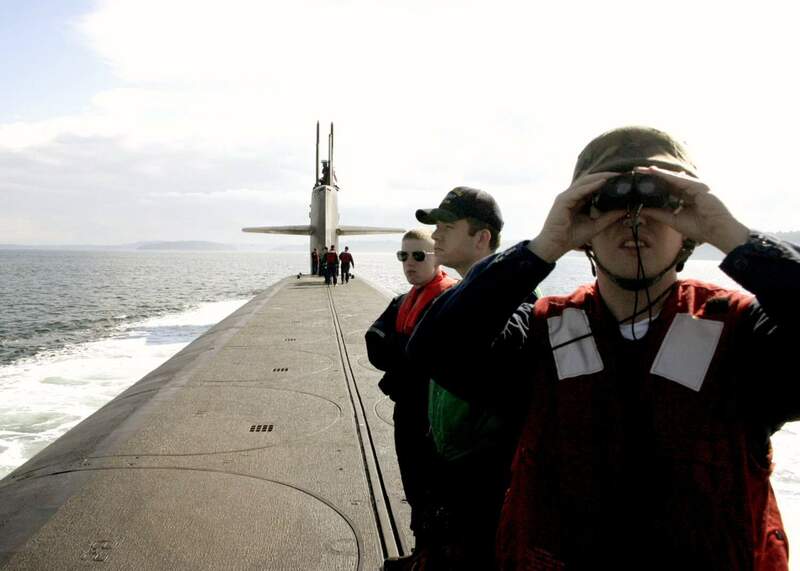 109k Chief Torpedoman Eric Ragan looks through binoculars while watching for a personnel transfer vessel to welcome the newest members of the crew aboard fleet ballistic missile submarine Louisiana (SSBN-743) on 28 June 2008 at Silverdale, Washington. 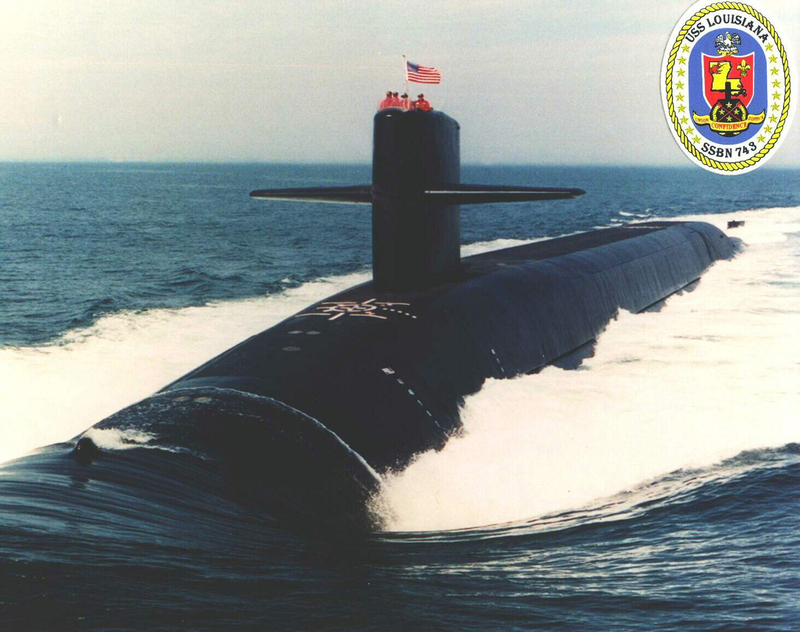 This year, Louisiana earned the Omaha Trophy making them the top ballistic missile submarine in the Navy. U.S Navy photo # N-9492C-001 by Electronics Technician 3rd Class Dominique Cardenas, courtesy of news.navy.mil. 131k In commemoration of the 50th anniversary of the Ney Program, a luncheon hosted by the International Food Service Executive Association was held on Saturday afternoon 5 Apr, 2008, at the Adams Mark Hotel, Denver Colorado for all Navy personnel. 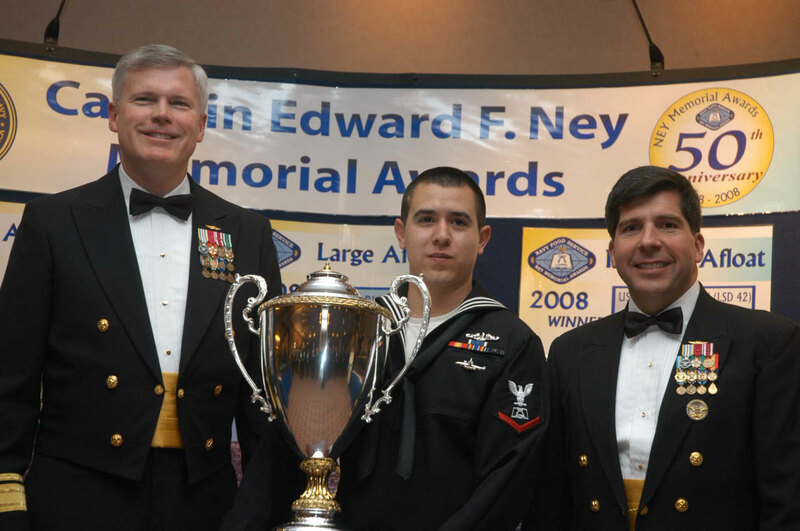 The NEY Awards Program as part of the Joint Services Ceremony and Banquet and was held on Saturday evening, which also included a 50th anniversary cake ceremony sponsored by IFSEA. Louisiana (SSBN-743) (Blue) received first place for the submarine category. Established in 1958 by the Secretary of the Navy and the International Food Service Executives Association (IFSEA) to improve and recognize the quality of food service in the Navy. Named in honor of Captain Edward F. Ney, Supply Corps, United States Navy, Head of the Subsistence Division of the Bureau of Supplies and Accounts from 1940 to 1945. Captain Ney contributed to the high morale, comfort and well-being of officers and men in the United States Navy. USN photo courtesy of Bill Gonyo. 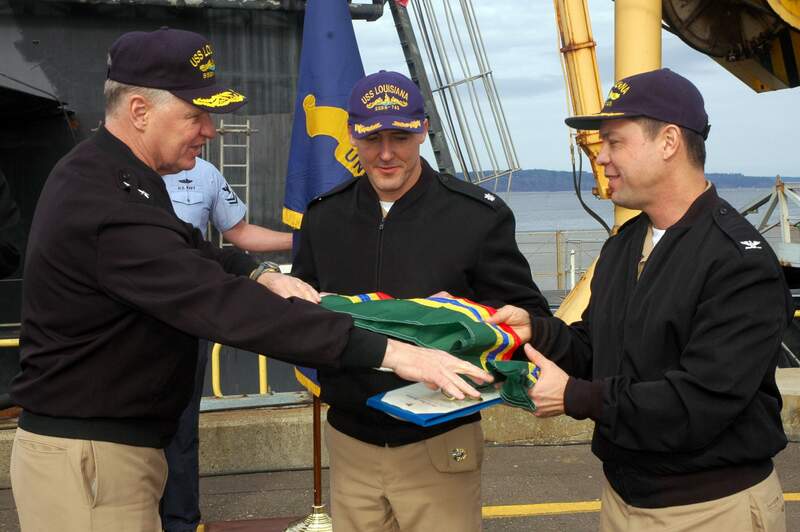 419k Chief of Naval Operations (CNO) Adm. Gary Roughead, left, presents a Meritorious Unit Commendation flag to ballistic missile submarine Louisiana (SSBN-743) Blue Team commanding officer Cmdr. Blake Converse and Gold Team commanding officer Capt. Shannon Kawane on 17 February 2009. Louisiana was awarded the Meritorious Unit Commendation medal for demonstrating sustained superior performance while setting fleet standards of excellence in administration, engineering, supply, personnel programs and community support. USN photo # N-8119A-075 by Mass Communication Specialist Petty Officer 2nd Class Gretchen M. Albrecht courtesy navy.news.mil. & submitted by Bill Gonyo. 1.25k Nineteen page Welcome Aboard the Louisiana (SSBN-743) PDF, circa 2009. USN photos courtesy of Scott Koen & ussnewyork.com. 217k The ballistic missile submarine Louisiana (SSBN-743) returns to homeport at Naval Base Kitsap-Bangor following a strategic deterrent patrol on 23 February 2012. U.S Navy photo # N-GU530-001 by Lt. Ed Early, courtesy of news.navy.mil. 632k Lt. Cmdr. 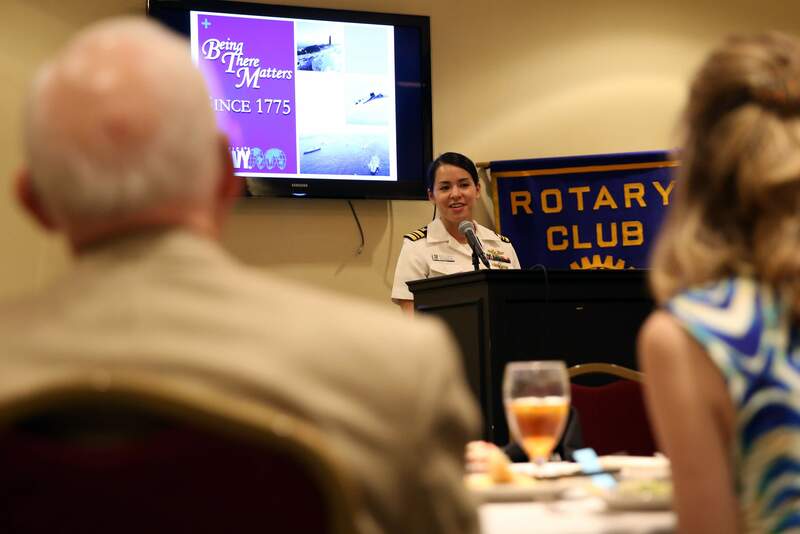 Maura Thompson, supply officer of the ballistic-missile submarine Louisiana (SSBN-743) and one of the Navy's first female submariners, speaks to the Bossier City Rotary Club about her experiences in the Navy during Navy Week Shreveport on 30 April 2015. Navy Weeks focus a variety of assets, equipment and personnel on a single city for a week-long series of engagements designed to bring America's Navy closer to the people it protects, in cities that don't have a large naval presence. US Navy photo # 150430-N-DC740-001 by Mass Communication Specialist 2nd Class John Hetherington, courtesy of news.navy.mil. 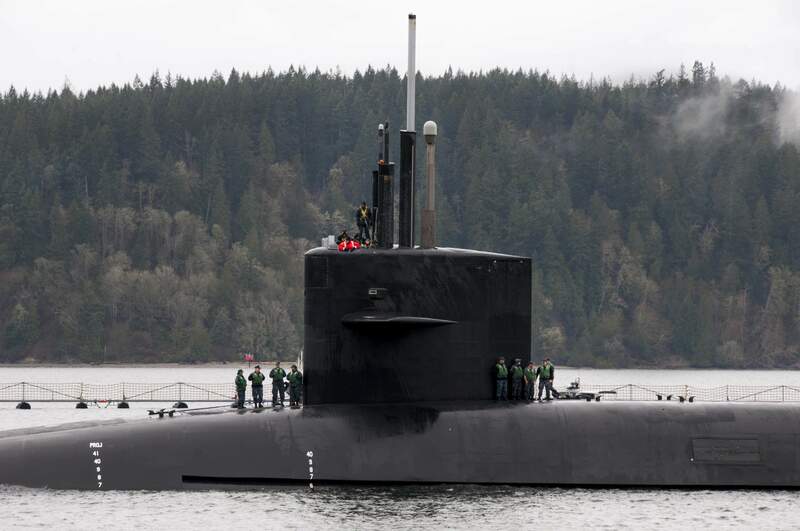 726k The Gold crew of the Louisiana (SSBN-743) arrives home on 4 March 2016 to Naval Base Kitsap-Bangor following a routine strategic deterrence mission. US Navy photo # 160304-N-TC277-041 by Lt. Cmdr. Michael Smith, courtesy of news.navy.mil. 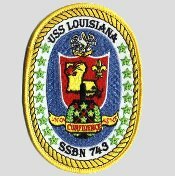 There is no DANFS History currently available for USS Louisiana (SSBN-743) at the Haze Gray & Underway Web Site, the main archive for the DANFS Online Project.